According to a new poll Americans are broadly in favor of direct negotiations and diplomacy with Iran over its nuclear program. Almost half think that the Republican letter to Iran, saying the deal could be off under a new president, was a step to far. The poll, which was conducted by telephone between March 13-15 by CNN/ ORC, found 68 percent of Americans support diplomatic negotiations with Tehran, while only 29 percent oppose them. Support wavers slightly across political lines, with 77 percent of Democrats in favor, compared to 65 percent of Republicans and 64 percent of independents. The poll comes after 47 Republican senators signed an open letter to Iran’s leaders where they said any deal with the Obama administration would need approval by the Senate. Only 49 percent of Americans thought it went too far, while 39 percent thought it was a suitable reaction to the way negotiations are continuing. 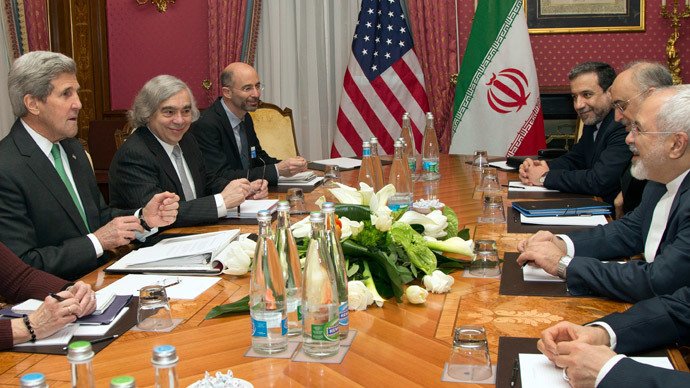 While just 18 percent thought the letter would help US attempts to stop the Iranians developing nuclear weapons. The survey also found that Americans by and large have greater confidence in President Obama to sort out major foreign policy issues than in Republicans in Congress. President Obama himself in an interview with Vice News said he felt “embarrassed” for those Republicans who had signed the letter. "For them to address a letter to the ayatollah, who they claim is our mortal enemy, and their basic argument to them is, ‘Don’t deal with our president because you can’t trust him to follow through on an agreement,’ that’s close to unprecedented," he said. The findings of the poll come as US Secretary of State John Kerry met with Iran's Foreign Minister Mohammad Javad Zarif in Lausanne, Switzerland, in a push to meet the end of March deadline for a framework deal on Iran’s nuclear program. The talks, between Iran, the US, Russia, China, France, the UK and Germany, are now in their second extension although both sides say there has been progress in recent weeks. However, a senior US official was more cautious and said that while progress had been made there was still some way to go if a deal was to be reached. "We have definitely made progress in terms of identifying technical options for each of the major areas. There is no way around it. We still have a ways to go. ... But even within this space, we have some tough issues to address," the US official told reporters on condition of anonymity. The focus of the dispute is on technical issues, including the possibility of retooling to make weapons. For example, centrifuges can enrich uranium up to levels for the fissile core of nuclear weapons. Iran continues to maintain that its aims are purely peaceful and wants to enrich uranium for medical, energy and scientific purposes.